We did finally finish our birthday marathon week. I needed a week to recuperate after it. I wrote about Star Child’s big 16th birthday bash. After her special weekend, we actually had my birthday, the girls’ birthdays and our anniversary. 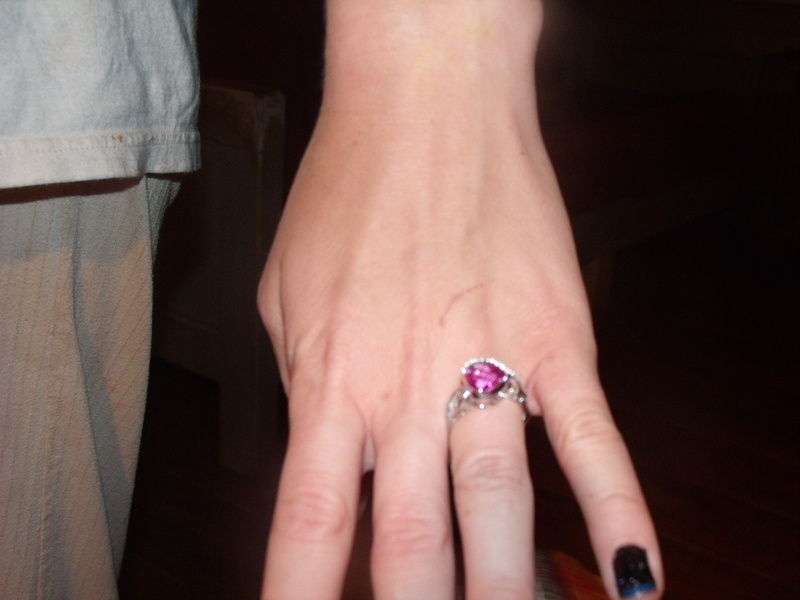 It’s a little hard to see, but this one is a pink heart surrounded by diamonds. She liked it. Just a few days after Star Child turned 16, Dee had her 17th birthday. Yes, they are less than a year apart, so that does make them Irish twins. 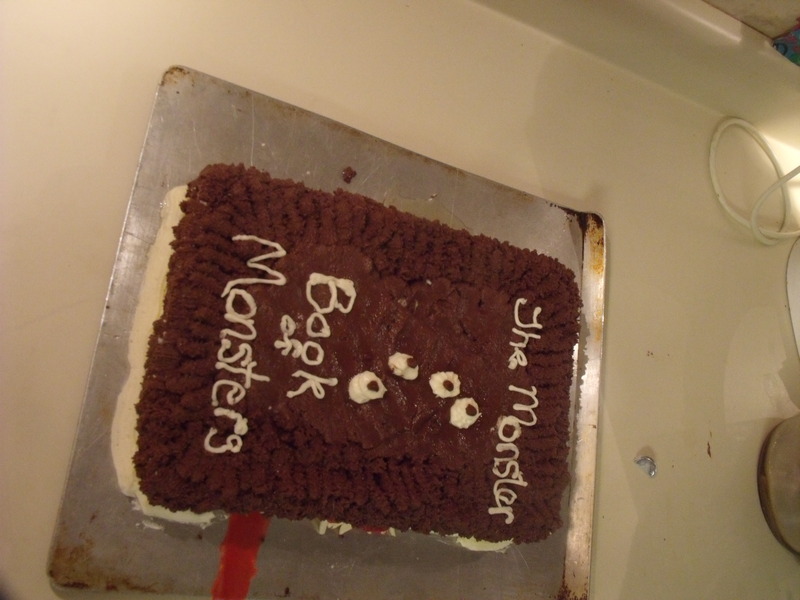 Dee wanted a Monster Book of Monsters cake (from Harry Potter) frosted with Nutella. Yes, Nutella. 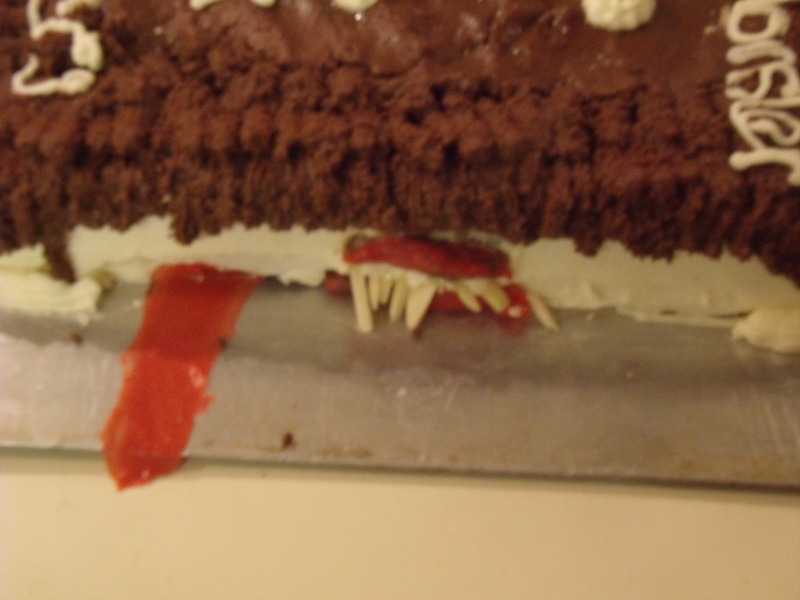 Let me just say that Nutella is not designed to be used as frosting. It is a chocolate hazelnut spread, and as such, it is very oily, especially when it is combined with other frosting ingredients and then squeezed through the frosting bag and decorating tips. It was quite messy. And oily. Have I mentioned it was oily? It kept separating, so I would have a solid mass of hardened chocolate frosting and then a drizzle of golden oil. I found it to be a disgusting mess, but Dee was happy as a clam. I made her a gluten-free cake since she has a wheat sensitivity. I was worried about the combination, but evidently Nutella frosting, as hard as it may be to work with, makes anything taste good. The highlight for Dee was her present. 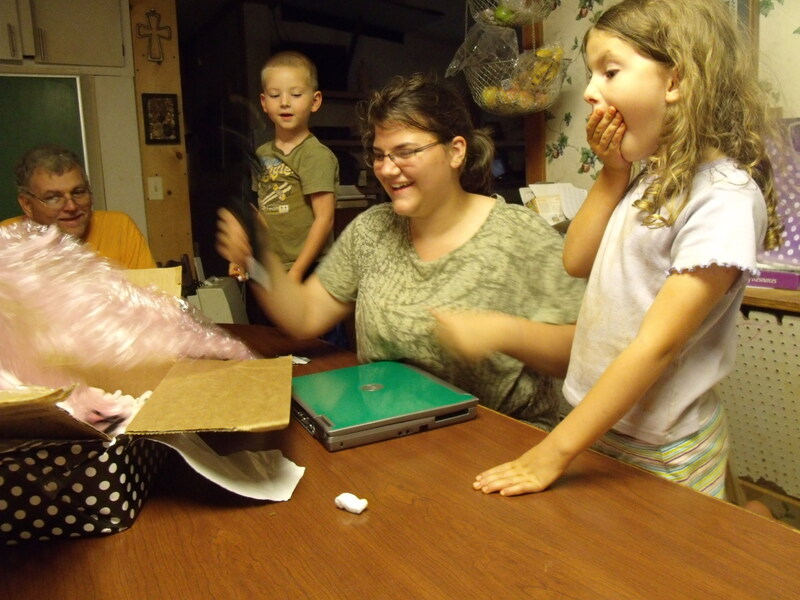 Since she is going to dual-enroll at the local college in the fall, we figured she needed a laptop computer. 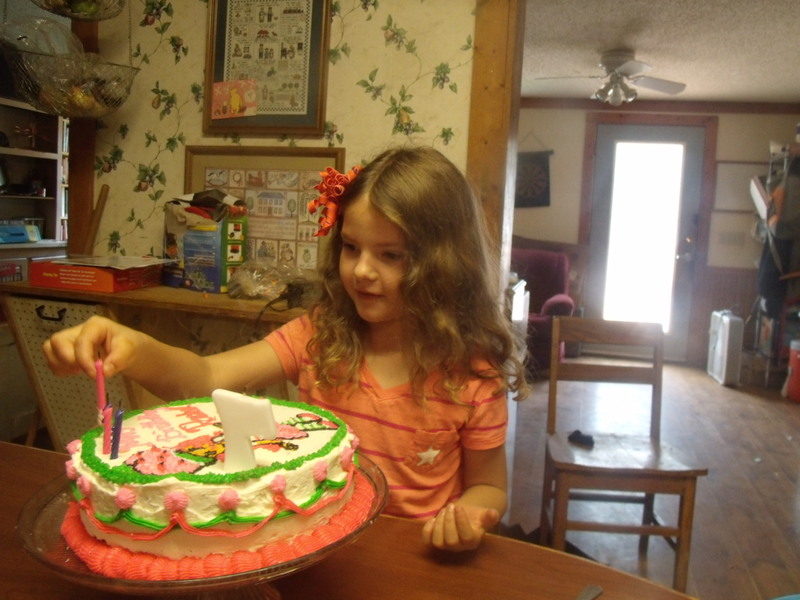 We couldn’t afford a new one, but we found a used one in her favorite color–green! She was pretty happy with her birthday celebration. Since her birthday was on the end of a busy week for us, we did her birthday dinner on the Sunday following her birthday. She had a friend up to eat dinner with us on Sunday, and we had a great time. Someone likes her birthday present! A few days after Dee’s birthday, the Handy Man and I celebrated our 18th wedding anniversary. We actually went to out to dinner and had a nice evening to ourselves. I love it when we can make that happen! 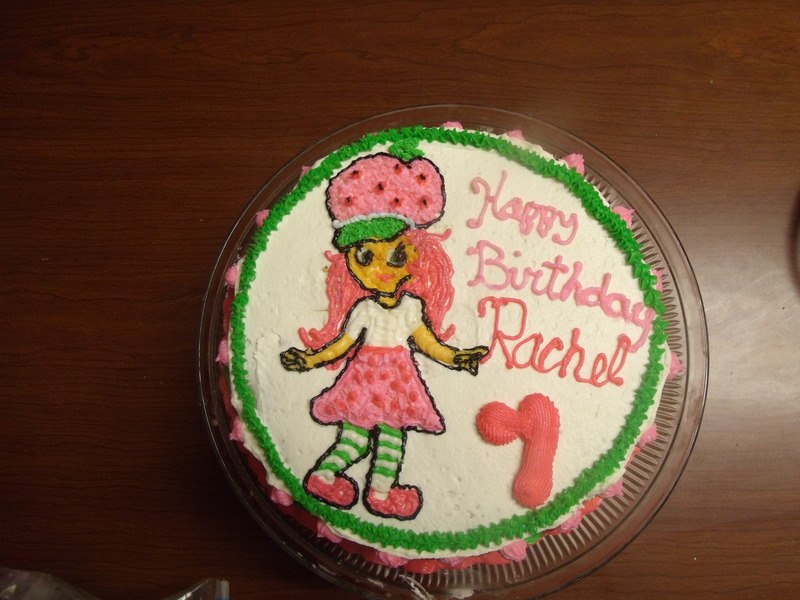 Other than the scary, weird hands, it sort of looks like Strawberry Shortcake, if you use some imagination! Little Princess loves lots of pink! We celebrated Little Princess’ actual birthday after the Handy Man and the big girls left by spending some time with my mother and father. They graciously came up to see us. We went to the park and then, a special treat, to the new Chik-Fil-A in our town. The kids had a great time, as did Omie and Opa and me. We played on the playground and walked the green trail near the train tracks. And then we went to Wal-Mart to pick out the fish for the tank Little Princess and Gladys Mae share. Omie went in with us while Opa sat in the car with the little boys. We all said goodbye and headed home, exhausted. It was a perfect way to end birthday marathon week!